I was in charge of organising catering for an event for 600 people and I over-catered for vegetarians! I had people coming up to me asking “where’s the meat?” and I had to tell them that “all the meat options were gone” and try to sell them the vegetarian options. Usually, it’s the other way around and the vegetarians are the ones asking “where’s all the vegetarian food?” because there are generally limited vegetarian options at events and meat eaters dab into the vegetarian food as well so it’s always gone before you know it. 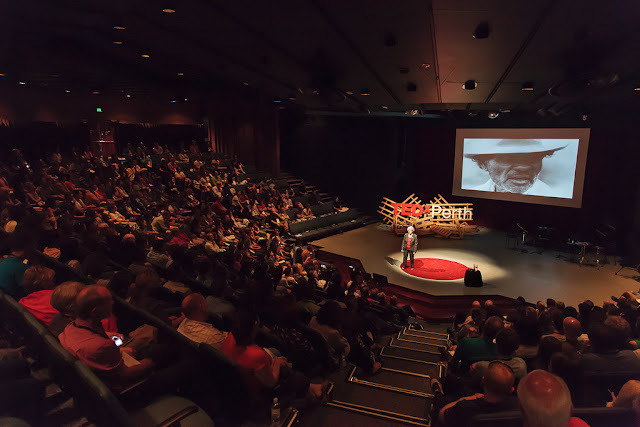 Last year on the 9th of December 2012, Perth had its first large scale TEDxPerth full day event (http://www.tedxperth.com/tedxperth-2012), with a line up of 15 of Perth’s finest thinkers and doers giving talks on Ideas Worth Spreading from across a range of fields and disciplines (you can watch video recordings of all the talks here http://www.tedxperth.com/videos). Karen: You’re a food blogger, you like food, you know other people that like food, your parents own a restaurant. 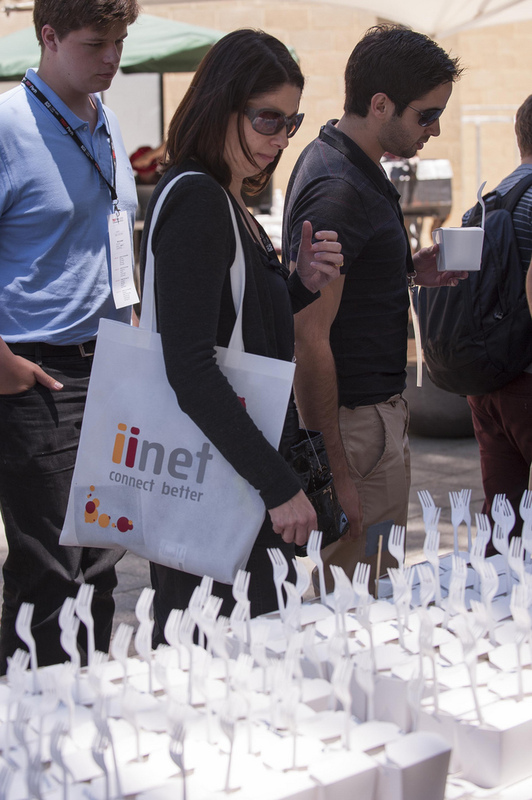 We need someone to help with the food for TEDxPerth. Me: I haven’t done anything like this before but sure. I have being friends with Karen for over 10 years. We’ve played in a band together and traveled to Japan so she knows I’m a ridiculously organized person, reliable and trusts that I will make good decisions. 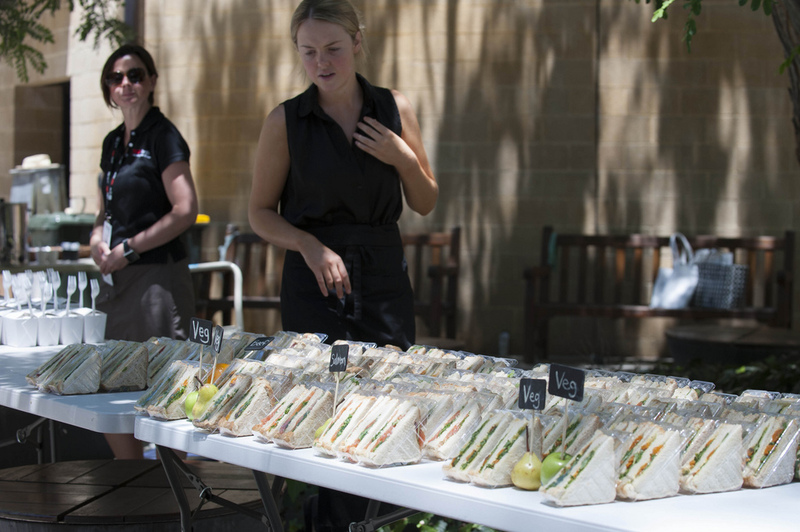 So with all these qualities, combined with my interest in food, I took on the role of being the TEDxPerth catering manager where I had to organize the catering and manage the logistics of food distribution on the day. Food is pretty important for an event, it’s the thing that people always comment on the feedback forms. It doesn’t matter how good your speakers are if people aren’t properly fed during the day, they won’t remember anything expect how bad the food was and complain. It’s like when I have to attend training for work and there better be an assortment of Danish pastries for morning tea or there will be hell to pay. I had a limited budget to work with. I researched all catering options in Perth and ended up going with Katrina Sykes Catering (http://www.katrinasykes.com.au/). Then I had to figure out the catering requirements for the day which included coffee/tea for registration in the morning, morning tea, lunch and afternoon tea. Most importantly, I had to make sure that I met all the dietary requirements for attendees as catering was provided as a part of the ticket price. People were required to complete their pre-registration by filling out a form which included indicating their dietary requirements. I had already factored in vegetarians/vegans and gluten free/coeliacs but was alerted to other dietary requirements from the pre-registration information that came through such as various allergies to food including nuts, eggs, seafood and cheese; people who were lactose intolerant; pregnant women with a list of things they couldn't eat; no pork; diabetics; and some unusual requests for no carrots or no tomatoes (maybe it's some new 'free-from' diet?!). It made me realize the challenges that food businesses must face on a day to day basis when they have to address a variety of dietary needs all the time. The number of people requiring vegetarian food was much higher than I originally thought. But it wasn’t a surprise as we assumed that TEDxPerth would attract an audience that was more socially conscious and thus may be more likely to be vegetarian. So from my assessment of all the dietary information provided to TEDxPerth, I came to the conclusion that half of the catering should be vegetarian. When lunch was served at the TEDxPerth event, all the meat options went quickly and I had people coming up to me asking where the meat options were. I then realized that I had made a mistake. I had miscalculated the amount of vegetarian food required. Not everyone had submitted their dietary requirements. The majority of people who made an effort to indicate their dietary requirements were those that had some. So it seemed like there were lots of vegetarians attending the conference when in actual fact it was just that more vegetarians filled in the ‘dietary requirements’ field and everyone else didn’t bother. Being a meat eater is the majority and not something that you would need to specify as a dietary requirement. I had failed to include meat eaters into my calculations. It was interesting to be in a situation where there was (much!) more vegetarian food available than meat and I had to tell the meat eaters to try some quinoa salad (which was met with weird looks, sometimes “what’s quinoa” was a common response) and roasted vegetable sandwiches. I got the feeling that a lot of meat eaters do not think much of vegetarian food. It was as if I was offering them foreign food. I guess for some people food isn’t food unless there is meat in it. But it was really nice to have people who were vegetarians come up to me and tell me that it was the best event they have ever been to because there was so much vegetarian food available. It must feel good to have the majority for once rather than the minority. Sure, there were people who complained about the lack of meat options but I guess I can't please everyone. The saving grace was that the vegetarian options provided by Katrina Skyes Catering were delicious. I think that for a lot of meat eaters, they automatically go for the meat options and would not think to consider the vegetarian options when they are out. But as a result of my miscalculations on the dietary requirements needed for the event, many meat eaters were forced to take on the vegetarian options because that’s all there was to eat! So in the end I think it was a good thing – maybe I changed the minds of a few meat eaters that day into thinking that vegetarian food is ok and maybe they will consider eating more vegetarian food in the future. Have you ever had to organize catering for something and things didn’t turn out as you’d expected? 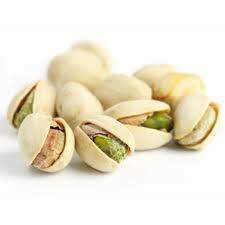 I have a lot of vegetarians friends and I am always looking for vegetarian recipes that will also appeal to meat eaters. 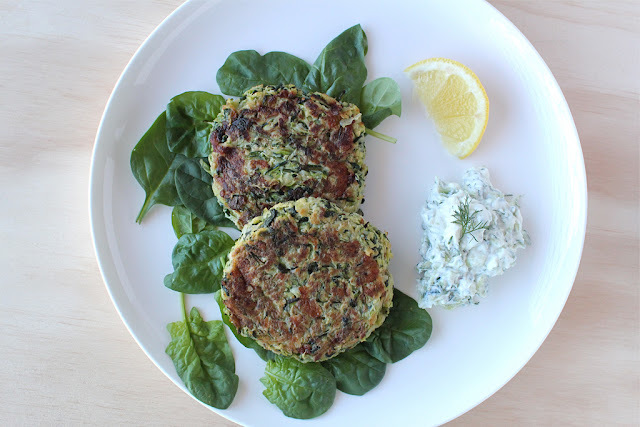 To make vegetarian food carnivorous, add umami as it adds a savoury, meaty taste to dishes. Vegetarian fritters are a vegetarian staple. Introducing haloumi into the vegetable fritter equation elevates it to something that will satisfy carnivores and vegetarians alike as haloumi provides a umami boost, lovely salty flavours and a crisp chewy texture. 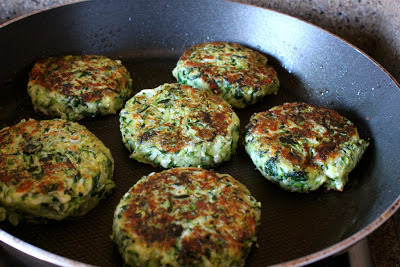 Note: I’ve had trouble making vegetable fritters in the past, where the mixture disintegrates when I fry it or it doesn’t cook through without blackening and burning them so my tips are to refrigerate the fritter patties before frying and to finish off the cooking in the oven. 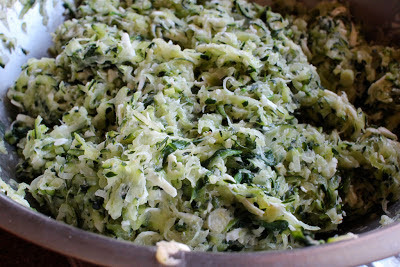 Grate the zucchini and salt them a little, set aside for 10 minutes and squeeze out as much liquid as possible. Wilt the spinach in a large frying pan with 1 tablespoon of olive oil. 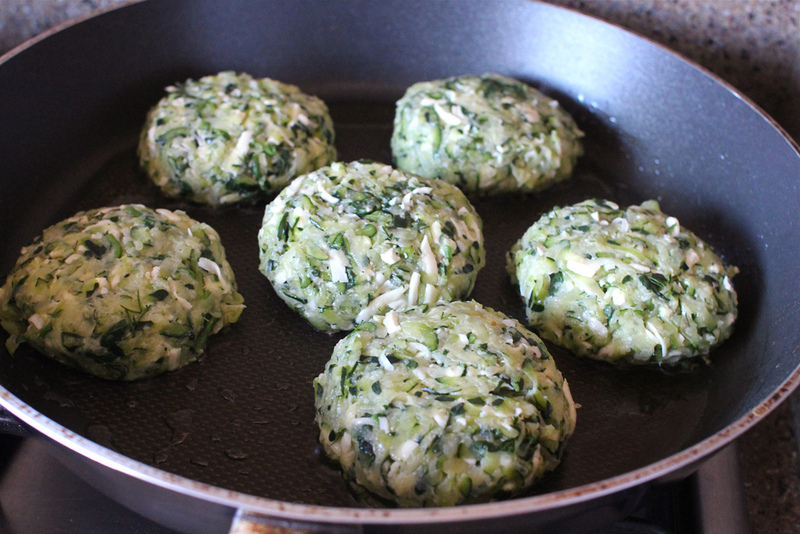 Remove and set aside until cool enough to handle, then squeeze any liquid from the spinach and roughly chop. 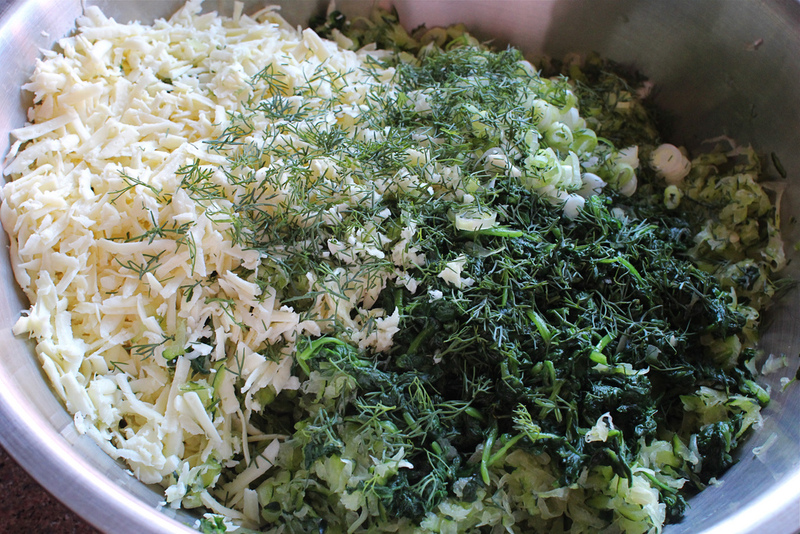 Place the grated zucchini in a large bowl, add haloumi, spinach, spring onions, dill, garlic, spices, salt and pepper. Mix together to combine. Shift flour over the mixture and mix in. Then add in the egg last and mix in. Shape the mixture into patties about 1-1.5cm thick and 7cm in diameter and refrigerate for at least ½ hour (you can make 14-16 fritters depending on the size you make the patties). Heat some olive oil in a frying pan over medium heat and fry the fritters in batches, for 2-3 minutes each side until golden brown. Carefully remove the fritters from the frying pan with a flat spatula and place them on a baking tray lined with greaseproof paper. 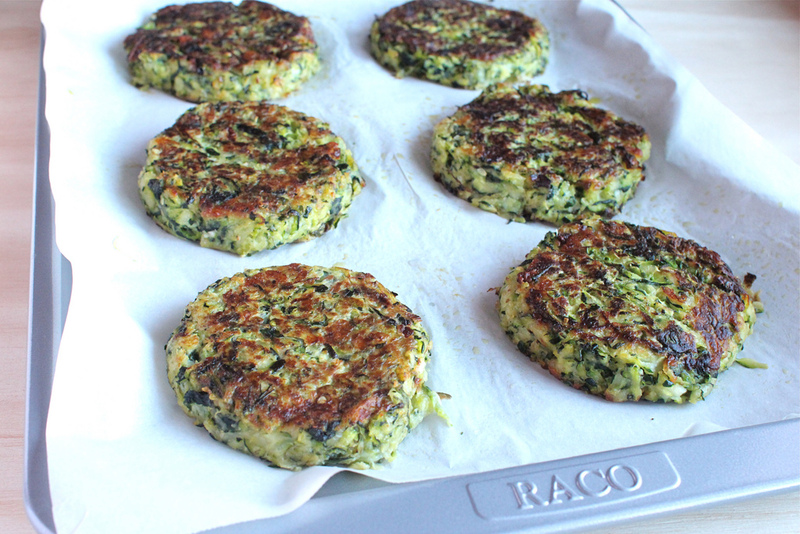 Bake the fritters for 10 minutes to finish cooking. 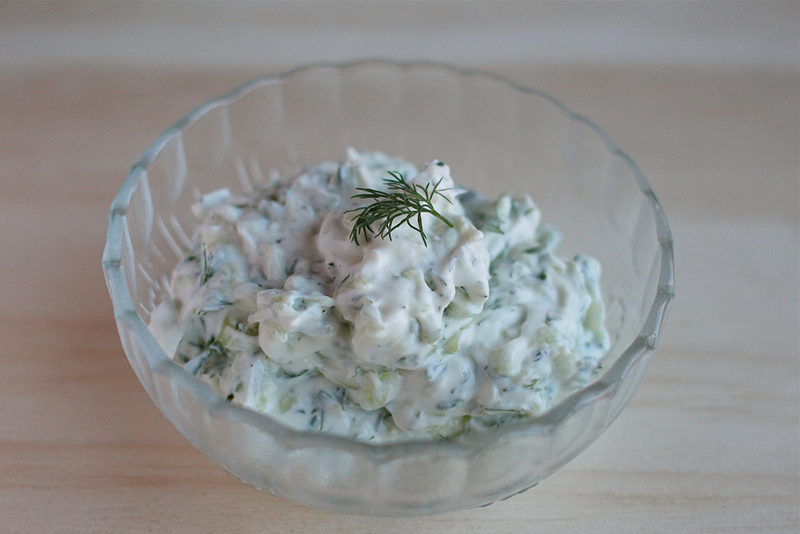 Serve with lemon wedges and tzatziki. 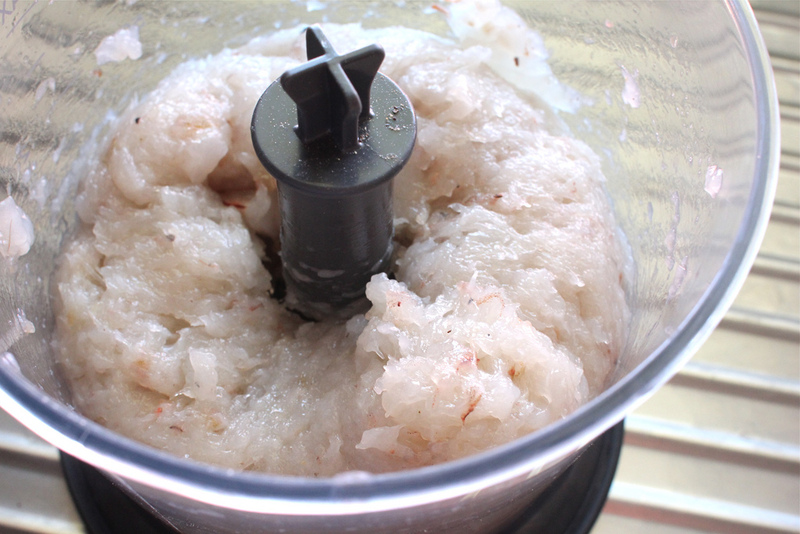 Drain the yoghurt by putting it in a mesh strainer lined with cheesecloth for a few hours in the refrigerator. Cut the cucumber in half lengthwise and use a teaspoon to scoop out the seeds. Grate the cucumber and squeeze to remove excess liquid. Combine all the ingredients together and season to taste with salt and pepper. This is a thought that often crosses my mind; and friends and family will remark on it when they see my dad. You would think that he would be tipping over the scales rather than under, right? Surely my dad who spends most of his time surrounded by food and does nothing but cook all day would be completely stuffed. But the reality could not be further from the truth. The fact is my dad has no time to eat or eats at very irregular hours, and often eats crap. My dad has breakfast in the morning which powers him through the lunch service. Then he cooks up a few dishes and all the staff at the restaurant sit down together for family lunner (aka the meal combining lunch and dinner, the opposite of brunch). After that it’s time to start prepping for dinner service and my dad won’t have a chance to eat properly again until after 10pm when the restaurant is done for the day. If my dad has time he’ll whip up something quick at the end of the day to take home to eat or my mum may have messaged him earlier and told him that there are leftovers from the dinner that she cooked for the kids. Sometimes it wouldn’t be a surprise to find my dad tucking into a bowl of 2 minute noodles when he gets home late at night. Because (1) he’s hungry, (2) he forgot or can’t be bothered to cook anything and (3) he’s too tired to care. I got an experience of this conundrum myself last year when I volunteered to help out with the Beaufort Street Festival cookbook “Recipes & Ramblings: A Food Journey from Beaufort Street and Beyond”. Recipe submissions were received from restaurants, businesses and community members who lived on and around Beaufort Street, and then tested and rated. 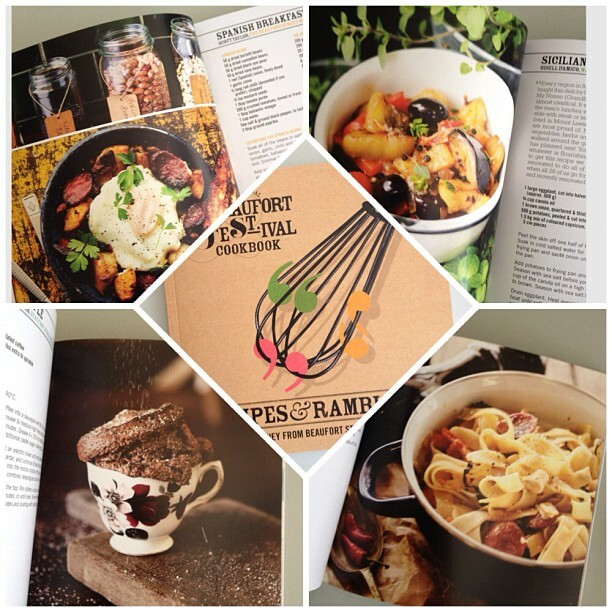 The best recipes were compiled into the very first Beaufort Street community cookbook. We were working towards a very tight deadline and at times I doubted if we could finish the cookbook in time for the festival in November, but we got everything done by the publishing deadline. About six weeks out from the launch of the cookbook we did the photo shoot over a weekend at Taste Budds cooking studio for over 50 recipes. The project manager gave me the responsibility for being in command of the kitchen and the cooking of the dishes while she oversaw the photography. I enjoyed overseeing the kitchen and would jokingly tell people that I was head chef and all the volunteer cooks were my sous chefs. Not that what we did would even remotely compare to what happens in a restaurant but it was a little taste. For the first time in my life, I was on my feet the whole day prepping and cooking food. I went in thinking that it would be fun and I would get to EAT ALL THE FOODS! But I didn't eat much food at all. There were two work spaces – kitchen/cooking and photography/styling. I had created a timetable which scheduled when dishes would be cooked and photographed. The kitchen and photography areas would work like a tag team. We started at 8am to get as much daylight as possible for the photo shoot. But of course nothing went as planned. The kitchen couldn’t keep up with the photography for a number of reasons. Things were a bit disorganized, especially on the first day. It was everyone’s first time doing anything like this so we were all learning along the way and getting into the groove of things. The cooking times for recipes are LIES! You think you need X amount of time to cook something and the reality is you need XYZ time. It’s not easy buying all the ingredients needed to cook 50 recipes over a weekend. Trying to somehow calculate how many cartons of eggs, bags of flour, blocks of butter, kilos of rice, meat, seafood, grams of nuts, bulbs of garlic etc. is needed in the most economical fashion. We had a shopping list and thought that we had bought everything we needed in the morning but there would always be missing ingredients, so a few more shopping trips had to be made over the weekend. For one thing, there never seemed to be enough chocolate no matter how many blocks we bought! Washing. Nobody likes washing. We had the luxury of being in a cooking studio with an endless supply of dishes, pots, pans, spoons, knives, forks to use so we would only wash when we need to reuse a pot or something. Everything else just piled up in the sinks out the back with no one to look after them. Everyone in the kitchen would try to wash a bit here and there when they had a moment to spare throughout the day, but in the end a lot of the washing was done at the end of the day with people staying back to help out. The dishwashers at restaurants must be the most underappreciated person in the kitchen but they are one of the most important! Oh and I cut my finger on the first day while opening a can (!) but I found one of those blue waterproof bandaids in the first aid kit and I thought, this is what it’s like on TV, these blue bandaids exist in real life! So the kitchen team was not pumping out dishes as fast as I thought we would. One of the volunteers in the kitchen with me on Saturday told me that she thought I was hilarious because I was running around all the time, unnecessarily so. I seemed to run rather than walk as I moved between the kitchen to the big fridge in the second room and the washing sinks out the back. I was trying to be fast I guess. Tip: Running around does not make your food cook faster. As dishes were finished, I would be proud and relieved to send it out to the stylists and photographers to work their magic. I couldn’t eat any of the food until it had been photographed and by then it was cold, the stylists and photographers had already had their dibs so I’m left picking at the remaining uncontaminated bits… you don’t want the bits that had been manhandled for the shoot…. Even then I was too busy getting the next dish ready to be scouting out the food. At the end of the first day, overseeing a kitchen of 4 volunteers cooks, including myself for the past 10 hours (8 hours cooking, 2 hours washing/cleaning), putting out 25 recipes, I was famished. I went home that Saturday night too tired to cook anything but luckily I had a container of pho in my freezer, so I boiled some noodles, heated up the broth and ate my first proper meal for the day. I didn’t have breakfast in the morning as I thought that there would be lots of food to eat and I didn’t want to fill up (rookie error!). I went to bed early that night and got up early the next morning to do it all again. Sunday was a little better, just. From the cookbook photo shoot, I gained a new found respect for my dad and chefs for the hard work they do in the kitchen, even more so when it became evident to me how little time you have to eat which seems a little ironic, don’t you think? For chefs, I imagine that the most important meal of the day would be the time of the day when all the staff get together for family meal. I really enjoyed this dish the first time my dad cooked it for me. 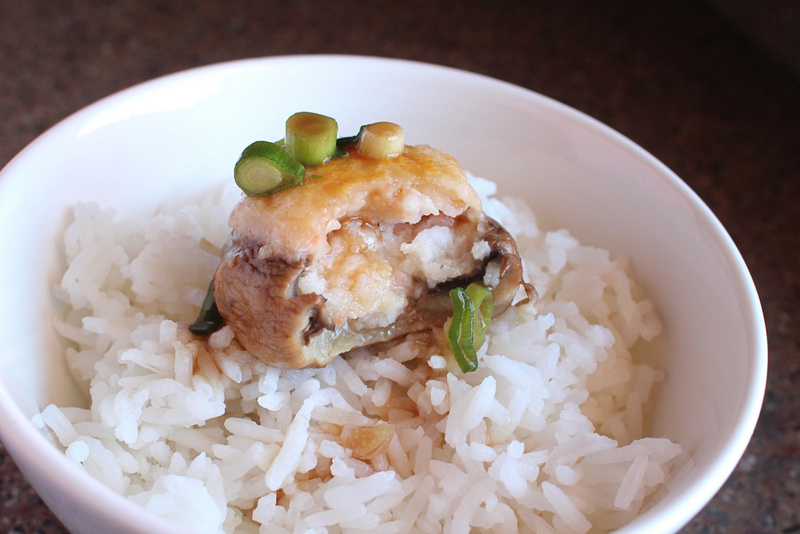 I was actually surprised at how good it tasted because I wasn’t expecting much due to the use of button mushrooms. I may be a little prejudiced towards button mushrooms as they are the least exciting mushrooms but their blandness suits this dish. 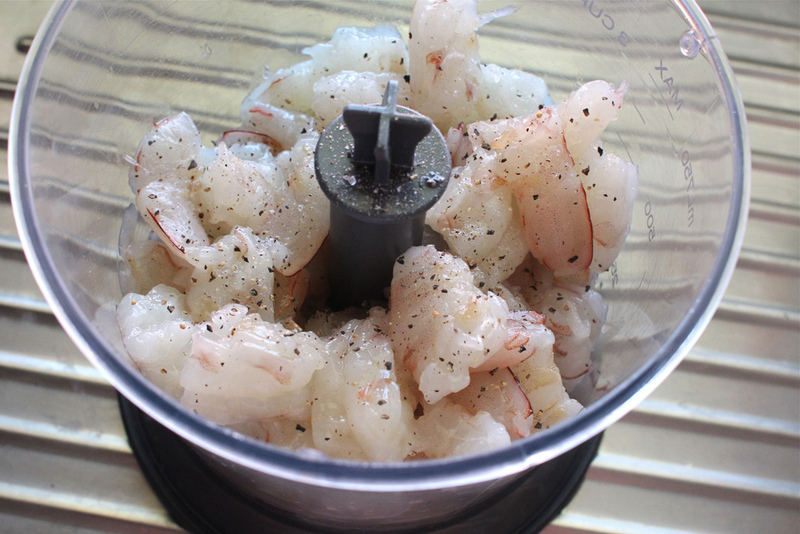 Using only prawns in the stuffing means that it cooks fast and there is minimal seasoning so you get the pure taste of the prawn. Encasing the prawn inside the mushroom prevents it from overcooking. 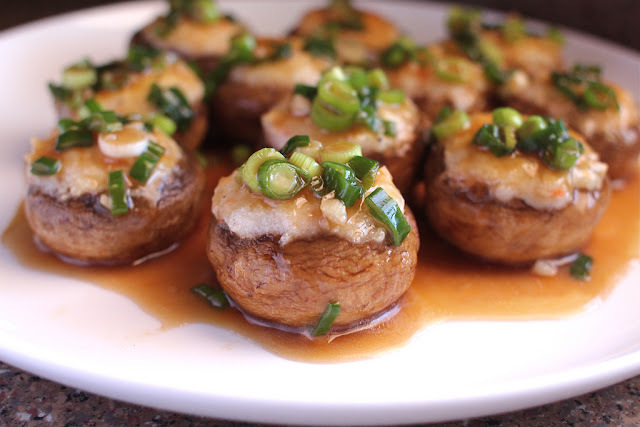 The oyster sauce compliments the stuffed mushrooms and it’s that classic oyster sauce based on a good chicken stock that often goes with Chinese dishes. This is one of the things that I like to cook when I am tired as it’s quick and tastes great. • ½ cup of chopped spring onion. Clean the mushrooms (wipe with a wet paper towel) and remove the stems. Put the prawns into a processor, add in a little salt and pepper, and process until it forms a paste. 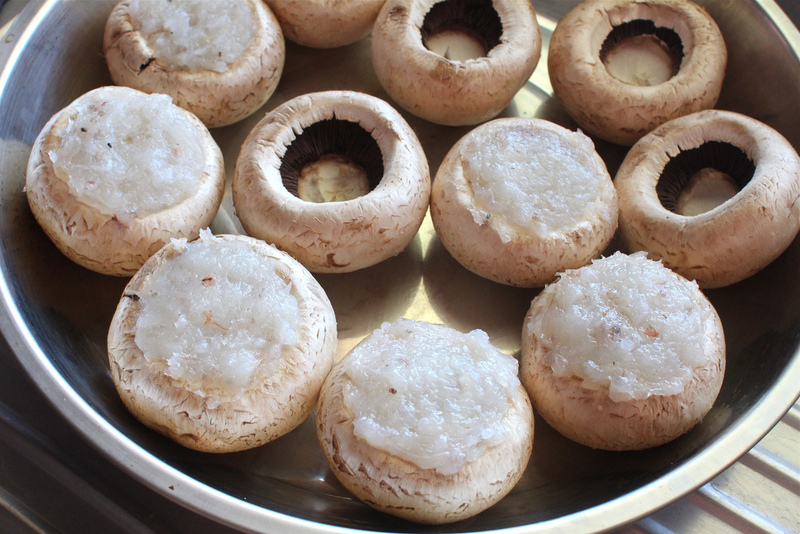 Using a teaspoon, fill the inside of each mushroom with prawn paste, pressing to spread the prawn stuffing evenly. Heat some oil in a frying pan and add the mushrooms into the pan, prawn side down and cook for 1-2 minutes until it’s changes colour and is slightly golden. 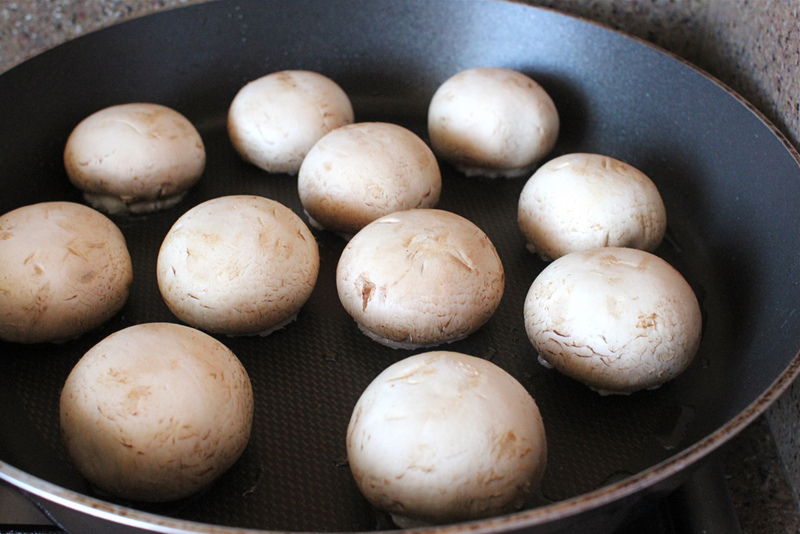 Turn the mushrooms over and cook for a further 3-4 minutes until the mushrooms are cooked through. 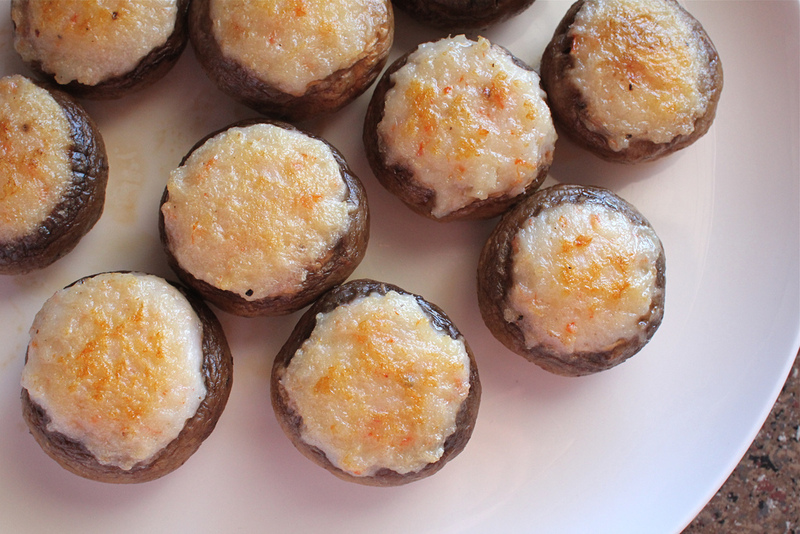 Arrange the mushrooms on a plate. In the same frying pan, add in the garlic and fry for 30-60 seconds until fragrant. 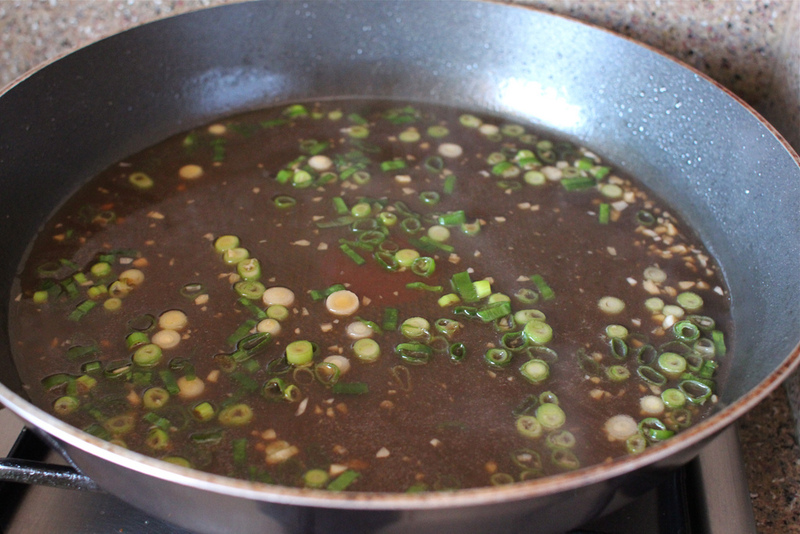 Add in the stock and bring to boil, then add in the oyster sauce, light soy sauce and salt to taste. Add in the spring onions and fry for a few seconds until it softens. Put some cornflour in a bowl and mix with a little water, then add into the pan a little at a time, stirring in to thicken sauce to desired consistency. 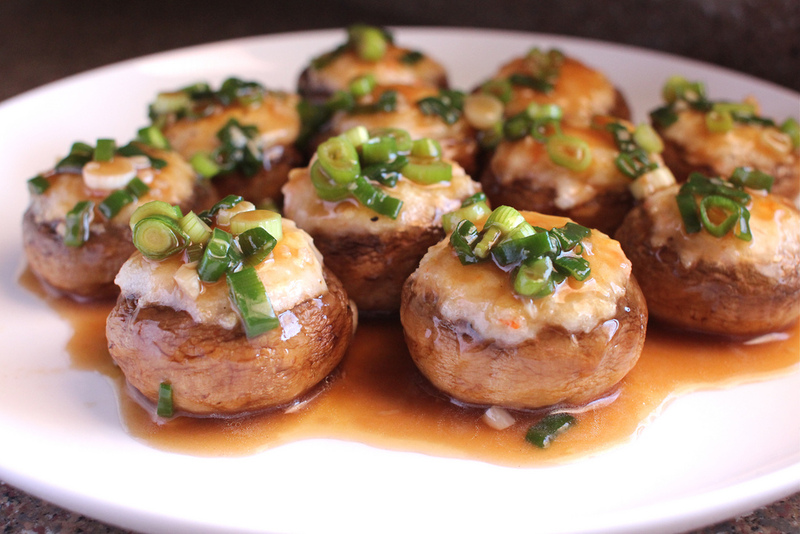 Spoon the sauce over the mushrooms.